Here is another card trying out the peg stamps. I also made this for this March's A Year in Cards free class at Two Peas in a Bucket. Visit their website and click on Education for more info. This video based class always gives me lots of ideas. This month is focused on background stamps, particularly masking off part of the stamp. I used the same method with these peg stamps as in my earlier wreath card. I stamped an image, rotated the stamp and stamped again before reinking. Some of the colors are embossed. To create the background, I tore a piece of scrap paper roughly the size of my greeting and adhered it with removable adhesive (I use Fiskars) to the card where the greeting should go. 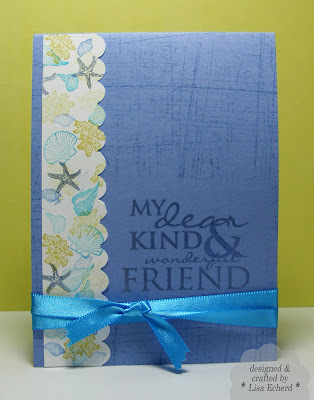 Then I stamped over the entire card with my favorite new stamp - Sanded from SU! After removing the scrap paper, I then stamped and embossed my greeting. I just love this large greeting from SU! It is also a favorite. Ingredients: Starfish and Shells by Rubber Stamp Tapestry; greeting from All Holidays by SU! TIPsy Tuesday - Inspiration TV?